THE TITANES were six elder gods named Kronos, Koios, Krios, Iapetos, Hyperion and Okeanos, sons of Ouranos (Sky) and Gaia (Earth), who ruled the cosmos before the Olympians came to power. When their father was king he imprisoned six giant brothers of the Titanes -the Kyklopes and Hekatonkheires- in the belly of Earth. Gaia was incensed and incited her Titan sons to rebel. Led by Kronos, five of the six brothers, laid an ambush for their father, seizing hold of him as he descended to lie upon Earth. Four of them- Hyperion, Krios, Koios and Iapetos- were posted at the four corners of the earth to hold Sky fast, while Kronos in the centre castrated him with an adamantine sickle. After they had seized control of the cosmos, the Titanes released their storm giant brothers from Gaia's belly, only to lock them away shortly afterwards in the pit of Tartaros. Ouranos and Gaia prophesied that a son of Kronos would eventually depose the Titanes, and so the Titan-king, in fear for his throne, took to devouring each one of his offspring as soon as they were born. Only Zeus escaped this fate through the intervention of his mother Rhea, who deposited him in a cave on the island of Krete and fed Kronos a substitute rock. Upon reaching adulthood, Zeus forced Kronos to disgorge his siblings, and with an army of divine-allies, made war on the Titanes and drove them into the pit of Tartaros, where they were bound. According to some (e.g. Pindar and Aeschylus) Kronos and the Titanes were afterwards released from this prison, and the old Titan became king of Elysium. The sisters of the six Titanes- Rhea, Theia, Mnemosyne, Themis and Tethys- were titled Titanides (or female Titanes). Many of their sons and daughters also received the appelation of Titan including Atlas, Prometheus and Helios. Elder Gods are superpowerful multidimensional entities which, at their furthest incursion into matter, manifest as huge clouds of gaseous star-matter. They feed off of high-energy vibrations emitted by living brains during periods of pain, tension, fear, expectation, ecstasy, and violent death. They were created from the pre-slack aethers at the same time as this universe. Originally, they were all one huge entity composed entirely of Nothing, known as "Affathaughth", but in order to achieve Somethingness, they lowered their vibrational level and split into separate wills. Most of the Elder Gods are now "sleeping" in the dimensionless Cold Wastes of Kadath, a condition they forced upon themselves to avoid being consumed by their own subconcious thoughts, which possesed physical form. They can still control affairs on Earth, however, with their psychic projections, "The Watchers". The Elder Gods are currently allied with the Negative Elder Gods. Some Elder Gods, known as the Rebel Gods escaped this sleep of cleansing and are still at large. 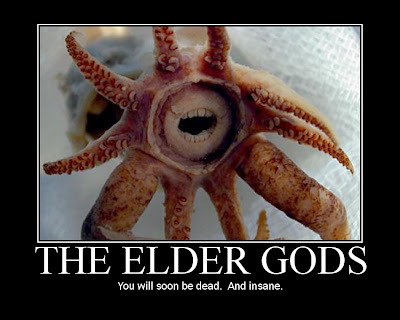 In post-Lovecraft stories, the Elder Gods oppose the Outer Gods and the Great Old Ones. Some consider them to be non-Lovecraftian because they employ a good versus evil dichotomy which is contrary to the cosmic indifference of Lovecraft's fiction. However, these deities are no more concerned for human notions of "good" and "evil" than the beings they oppose and consider humans to be less than fleas although they can be sympathetic to humanity on occasion and their interests usually coincide with our own. A notable attempt to harmonize the good versus evil dichotomy with cosmic indifference was made by Gary Myers in his collection of Dreamlands fantasies, The House of the Worm (1975). According to Myers, the Elder Gods are identical to the mild gods of earth who figure in Lovecraft's "The Other Gods" (1921) and The Dream Quest of Unknown Kadath (1927). These gods found the Great Old Ones already asleep, and were so terrified at the sight of them that they wove powerful spells over them to try to prevent their waking. But the passage of time has weakened both the spells and the gods who wove them, and it is doubtful that either will have much power to put off the hour of the Great Old Ones' return. The main "Elder God" used by Lovecraft is Nodens, who acts as deus ex machina for the protagonists in both The Dream-Quest of Unknown Kadath and "The Strange High House in the Mist" (1931). In this regard, he functions like Lovecraft's Nyarlathotep, although Nodens is obviously less malicious. Another entity mentioned as an Elder God is Hypnos, the Greek god of sleep. He appears in the story fragment "Hypnos" which is about a mediocre poet who is suddenly granted the power to usher in a new Golden Age. It is also speculated that Bast, the Egyptian goddess of cats, qualifies as an Elder God due to Lovecraft's feline obsession and because of hints given in Lovecraft's "The Cats of Ulthar" (1920). Lovecraft does not distinguish between the "Elder Gods", "Outer Gods" and other entities in the way that subsequent writers have.